This week's share includes a big, beautiful Sirloin Steak from Tad at Feather Brook Farms. We cooked Tad's sirloin in a cast iron pan and sliced it onto a flatbread pizza, pictured above. The word sirloin comes from the Old French surloigne meaning above the loin. According to Wikipedia, there is an oft-repeated anecdote that says the name comes from a time when “King James I of England, while being entertained at Hoghton Tower during his return from Scotland in 1617, was so impressed by the quality of his steak that he knighted the loin of beef, which was referred to thereafter as "Sir loin".” Wikipedia goes on to say that this is held to be a myth, but we like the story of “Sir Beef”. Erin wants to use that as the name for our next dog. The steaks are wonderfully savory and simple. As always, a cast iron or a grill treats 'em right. 3-4 minutes per side (130F for medium rare), a sprinkle of salt and pepper and you're ready. Don't forget to let them rest before slicing to add to your favorite sandwich, flatbread or directly to your face. Cooking the onions and mushrooms in the left over beef fat will introduce a lovely depth to your dish. 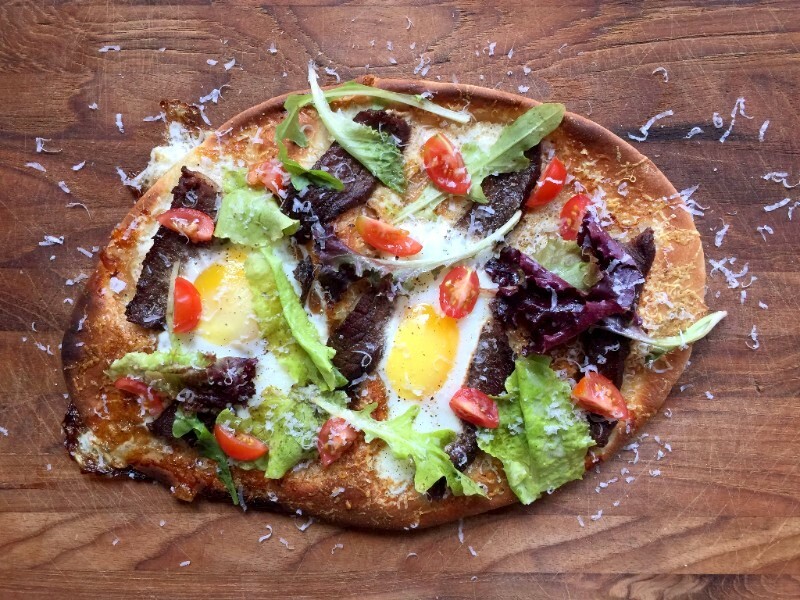 Seared steak on Flatbread: There are limitless options for the delicious flatbread from Iggy's. Cheese, no cheese, with meat or all veggie. This recipe calls for searing and slicing the steak and taking a bit of time to elevate your onions in vinegar. Beef, Broccoli and Mushroom Stir Fry: Easy Sunday cooking to have all week for a work lunch. If you don't have all the ingredients, you can simplify. Cut the beef into small pieces and marinate for a few hours. Pour everything, marinade and all into a cast-iron. When the steak is done to your liking, remove it and add the cut up broccoli and sliced onions, cook until tender. Reincorporate the beef at the end and serve over rice, noodles, or greens. Voila. Keep your mushrooms happy. The oyster mushrooms from Myco Terra are tender and delightful. Using them right away is best, but if you need to store them for a few days, take them out of the plastic they arrived them and move them into a paper bag. Fold the bag over and store them in the main part of your fridge; not the crisper. They will stay for up to a week. Trim the stems before serving as they can get a bit tough.